Liposome Extruder Membrane is made from high quality polycarbonate film and has sharply defined pore sizes. It has high flow rates and excellent chemical and thermal resistance. The membrane has a smooth flat surface for good visibility of particles. Features include low protein binding and low extractables ensuring no sample contamination. 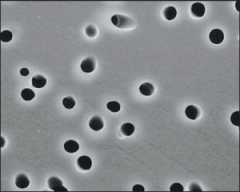 The pores are absolutely-rated, precisely cylindrical, and narrowly distributed, allowing their surfaces to capture 100% of particles larger than pore sizes.